The Third, or final Cycle, can represent a flowering of our inner being, such that our true nature has finally come to fruition. It is during this period that one has the greatest degree of self-expression and power. Your Third Period Cycle is represented in the wave at the bottom of the numerology chart, and is based on the Year of your birth. 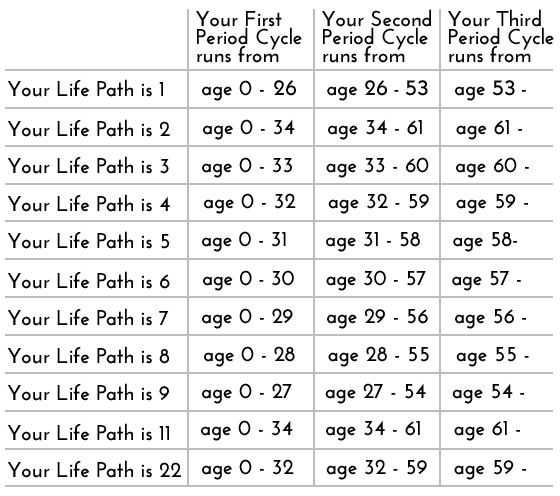 The table above shows the duration of the Period Cycles based on your Life Path. To find your Third Period Cycle, add all four digits of your birth and reduce to a single digit. For example, if you were born in 1998, add 1 + 9 + 9 + 8 = 27, then add 2 + 7 = 9. Your Third Period Cycle would be a 9. Read the meaning of your Third Period Cycle. Today, the popularity of numerology continues to grow. Numerology columns now appear regularly in newspapers and magazines. Numerologists are consulted with increasing regularity for everything from personal romance to business decisions. As the industrialized world becomes more computerized and dependent upon statistics and number systems, the fascination with the age-old science of numerology only grows.